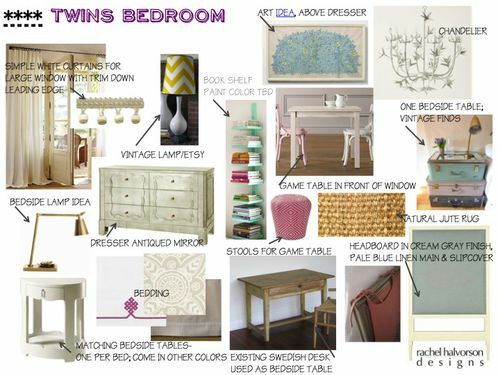 One of my first experiences with long distance clients (true E-design/ without ever seeing the space in person) was a bedroom for twins girls. After having everything delivered and installed a while back I have been anxiously awaiting pictures. For long distance clients the process is a little different. The client does a little more leg work on the front end- sending pictures, measurements, and inspiration images. I then mail samples, memos to the client to finalize colors, fabrics, bedding, etc. Obviously some things change from the initial plan once we get started. I always like to include atleast a few old, unique pieces and those require some searching. 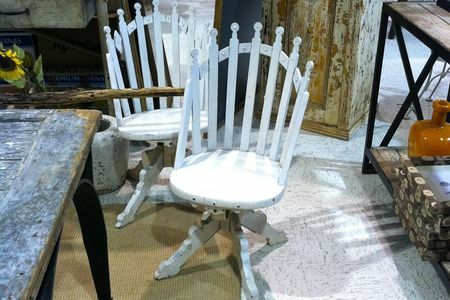 For example, I found these cute antique chairs at Scotts that I wanted to use in front of the window. Perks of being a long distance client? You receive "insert Rachel for scale" pictures. Where you can really see the scale of the furniture-.... I'm basically a virtual Vanna White. See.?? The chairs are small. Kid size. *is anyone impressed that I know what a bla-bla is. *Vintage suitcases from various different sellers on etsy. We had a mirrored top made for it. We are still working on this side of the room, but waiting on the right piece of artwork is never a bad thing. Chest by Bungalow 5 through RH; custom made bookcase tower, artwork through etsy; lamp base from Pottery Barn, lamp shade through etsy seller. I always say to keep kids rooms simple. Sure your kids will cry for a cobalt blue room and accuse you of trying to ruin their life... but that's besides the point. 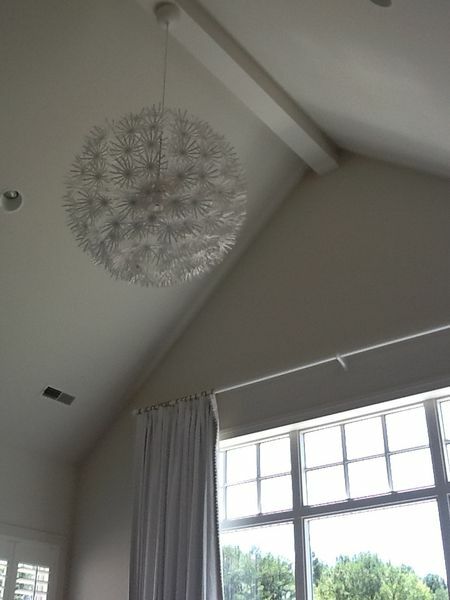 Think about the tone, the mood you want to set for the room. 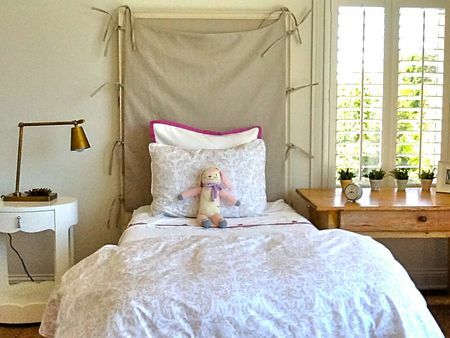 While the twin's room still feels young and full of life, it is also very serene and peaceful. Which is exactly what you want to encourage in a bedroom with two 4 year olds. 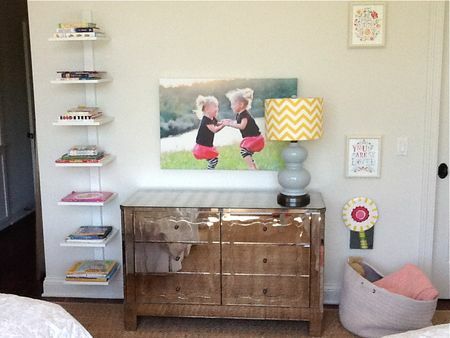 If you took out the artwork, and a few accessories you'd still have a neutral palette to work with. 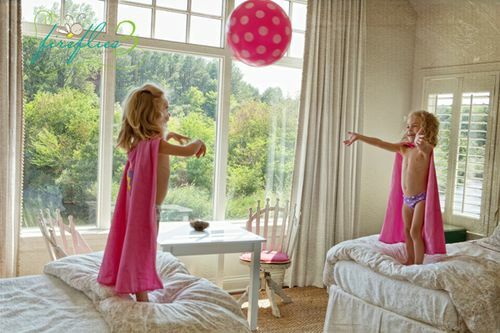 And when they come in with their hot pink superman capes and polka dot beach balls?? There's your pop of color. (Thanks to Fireflies 3 photography for sharing most of these images; and to my clients for giving me permission to show off their beautiful girls! Virtual Vanna- don't wear it out.